Within Green tea, there are two types: One made from the mixing of tea powder and water; And one made by boiling tea leaves. 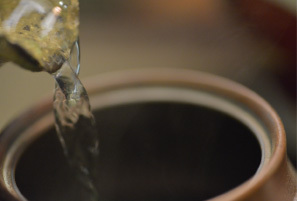 Using only the highest ranks of teas, “A drip of tea” style uses the boiling of leaves. 1,000 years prior to the era of sado (or tea ceremony), which began 500 years ago, the brewing of tea leaves became common. Regardless of technique we hope to simply understand the essence of the tea. <1> Small bowl: Brewed with 30℃ cooling boiled water. There’s only a small amount, so we drink it all in one gulp. This technique brings out the best flavor and relaxes us from within. <2> Large bowl: Double brewed in boiling water at 80℃. The brewing of this brings out an interesting mix which both stimulates and relaxes. It was especially enjoyed by the monks of old, as they practiced “zazen” (or the floating mind). <3> Used tea leaves: Pure delight. Used tea leaves are an excellent source of dietary fiber and vitamin E, and they dissolve well in oil, making it perfect for salad dressings. The beauty of this is to not care about ceremony, and simply enjoy. There’s no need for reservations.